There is a ferocious spiritual war in America, and Oklahoma City seems to be at the center, targeted by malevolent people and forces. In 2009 when Republicans were in control, the state legislature gave the green light for a Ten Commandments statue, paid for with private funds, to be placed outside the state capitol building in Oklahoma City. Three years later, in November 2012, a 6-feet tall granite monument of the Ten Commandments was erected. Almost immediately, the American Civil Liberties Union (ACLU) leveled a lawsuit to remove the monument, claiming that it violated the state constitution’s ban against using public property to support church or religion. Then, on September 21, 2014, a local satanist group conducted a blasphemous “Black Mass” right smack in the Oklahoma City Civic Center. Mark Vaughan, the company’s chief operating officer, who is also a reserve sheriff’s deputy, shot Nolen, stopping the attack. Nolen was charged with first-degree murder and assault and battery with a deadly weapon, and may also face federal charges as well. Workplace violence? You can’t be serious! Oh wait — the FBI must mean “workplace violence” as in the case of Maj. Nidal Malik Hasan,the terrorist convicted in the 2009 Fort Hood shooting that killed 13 people and left many more wounded. On September 19, 2014, the ACLU’s lawsuit to remove the Ten Commandments monument was thrown out by an Oklahoma County judge. So satanists took matters into their own talons. The suspect told the Secret Service, upon his arrest, that Satan had told him to do it. He admitted that he had urinated on the monument before running it over. The suspect reportedly also made vague threats at the Oklahoma City Federal Building and said he would kill President Obama and spit on a photo of Obama. The man was taken into custody. The vehicle involved was abandoned and has since been impounded. 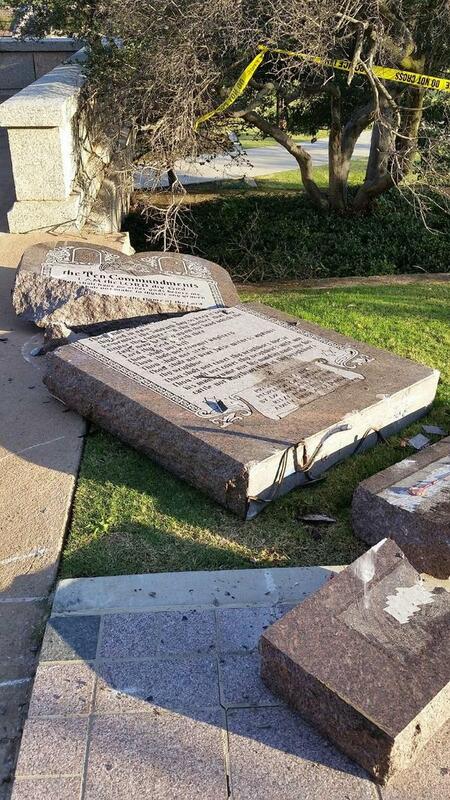 The cleanup is underway and parts of the Ten Commandments monument will be restored. An official with the US Attorney’s Office said if enough evidence is found against the suspect regarding his alleged threats against the president then a report will be submitted to the US Attorney’s Office. Anyone with information about the incident is asked to call OHP at 405-425-7709. The police have since identified the man asMichael Tate Reed Jr., 29. He is from Roland and was taken to Oklahoma County mental facility for an emergency order of detention and a mental evaluation. Well, mom. I suggest you ask your son who “his God” is.